My Kauai photos were taken in March 2010 on our beach resort vacation on Kauai's eastern coast. Our resort was right on a Kauai beach and the surf was amazing! I took this vacation with my sisters and we had a great time. 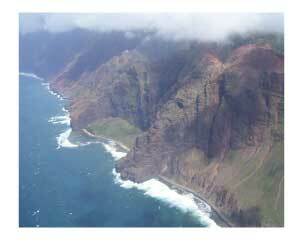 This is the Napali coast, on the north end of the island. This area is only accessible by boat or on foot. This doesn't really look like Hawaii to me because I don't expect pine needles in the picture! 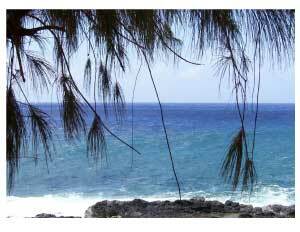 But it is, indeed, Kauai's southern coast, near Poipu. Yes, I know, everyone takes this picture - but why not? It's a stunning view! 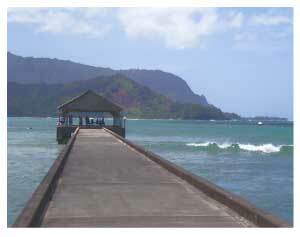 This pier was used in the movie "South Pacific". And if you use your imagination, the mountain in the background is the head of a dragon (there's a brown spot that marks the eye) and was the inspiration for the song "Puff the Magic Dragon". 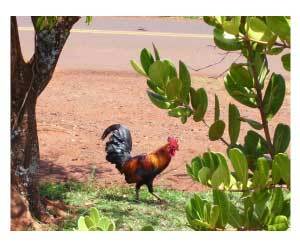 This may seem like a strange photo for Kauai, but there are TONS of roosters everywhere on the island! Their cages were destroyed by Hurricane Iniki so they are now wild - and the most beautiful wild roosters I've ever seen!